Forest Plans of North America presents case studies of contemporary forest management plans developed for forests owned by federal, state, county, and municipal governments, communities, families, individuals, industry, investment organizations, conservation organizations, and others in the United States, Canada, and Mexico. The book provides excellent real-life examples of contemporary forest planning processes, the various methods used, and the diversity of objectives and constraints faced by forest owners. Chapters are written by those who have developed the plans, with each contribution following a unified format and allowing a common, clear presentation of the material, along with consistent treatment of various aspects of the plans. This work complements other books published by members of the same editorial team (Forest Management and Planning, Introduction to Forestry and Natural Resource Management), which describe the planning process and the various methods one might use to develop a plan, but in general do not, as this work does, illustrate what has specifically been developed by landowners and land managers. This is an in-depth compilation of case studies on the development of forest management plans by the different landowner groups in North America. The book offers students, practitioners, policy makers, and the general public an opportunity to greatly improve their appreciation of forest management and, more importantly, foster an understanding of why our forests today are what they are and what forces and tools may shape their tomorrow. 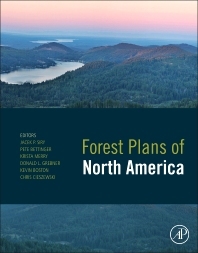 Forest Plans of North America provides a solid supplement to those texts that are used as learning tools for forest management courses. In addition, the work functions as a reference for the types of processes used and issues addressed in the early 21st century for managing land resources. Students, practitioners, policy makers, and those interested in learning about the current state and status of forest planning efforts in North America. Additionally, forest management, environmental management, forest planning, and even introductory forestry courses could use the example cases from the work.